Foot pain is quite common: podiatrists estimate that about two thirds of the adult population have experienced long-term foot pain at some point in their lives. Feet are a complex part of our body, containing lots of tiny bones and joints – each supported by a network of muscles, tendons and ligaments. It is therefore not surprising that many of us experience foot pain at some stage. Foot pain is often described as a nagging, burning or sharp pain sensation. Foot pain can manifest itself on the top, side or bottom (soles) of your feet. Heel pain is also common. Many people experience foot pain when getting up or after a period of rest. Foot pain can also occur after walking. The causes of foot pain can vary greatly. Common causes include nerve pain, heel spur, diabetes, rheumatism and arthritis. Foot pain can also be a result of overtraining or sports injuries. 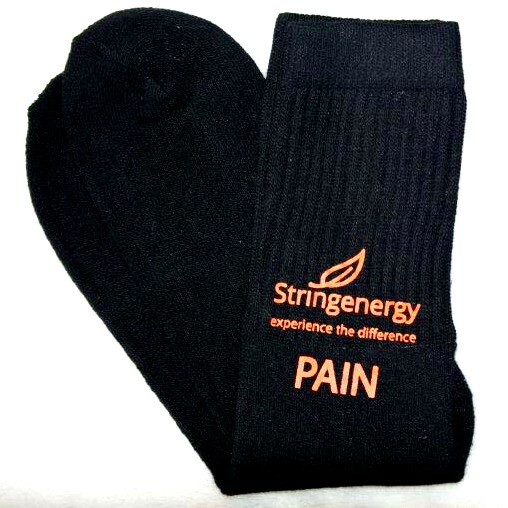 Stringenergy’s Pain Relief socks offer a natural and effective solution for the treatment of foot pain. 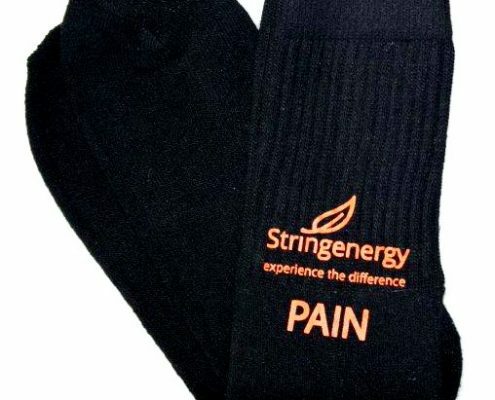 The socks have been treated with String Energy and hence reduce pain signals between your nerve cells. You will notice an improvement in your symptoms within 10 minutes of wearing the socks. Pain Relief socks ease your symptoms quickly & efficiently! The RLS socks in sizes M and L are made of bamboo. The RLS socks in the sizes XL and XXL are made of cotton. Pain Relief socks should not come into contact with non-natural materials (e.g. carpet made from synthetic material). Preferably only wear the socks in bed or on the sofa. Wash the socks by hand only in cold or lukewarm water (preferably without any detergent). Do not let the socks soak in water.